Partners - Samlerhuset Group B.V.
Samlerhuset Group B.V. is a proud partner to most major mints and central banks around the world, working closely on collections and commemorative coins. The Samlerhuset Group´s knowledge has both depth and breadth, extending across many markets and also back through time. This means we are able to add value to major coin programs, especially if and when we become involved at an early stage. However, far from acting simply as consultants, our strength is in the delivery and execution of sales programs which can amplify the success of any well-designed collector´s coin program. 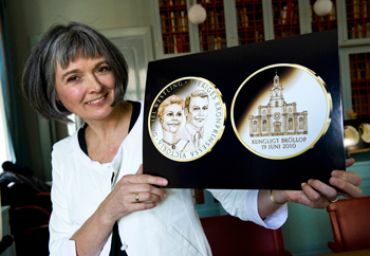 Picture below: Ingrid Austlid Rise is a renowned goldsmith and coin designer at the Norwegian Mint. In 2015 the British Medal Art Society´s Struck Medal Award was awarded to Ingrid for her medal of Tormod Hermansen. Earlier Rise also took part in a design competition for the Royal wedding medal depicting Victoria, Crown Princess of Sweden, and Daniel Westling. Rise´s design was unveiled at the Royal Coin cabinet in Stockholm, Sweden.